So I said, “Hey Charile! I got your trading card over here!”, And he was genuinely shocked. “Get out! I have a trading card!”, He said as he briskly strolled over to me in the visitors end zone. Charlie smiled and looked at it, and gleefully showed it to his wife. He was so excited he and I took a picture together (- that in retrospect will possibly never see the light of day). “Don’t worry, my wife posts everything to Twitter,” Ebersol said as he penned the card. He thanked me, but before turning around, reached into his pocket and gave me a league lapel pin. For a brief moment, I felt special. 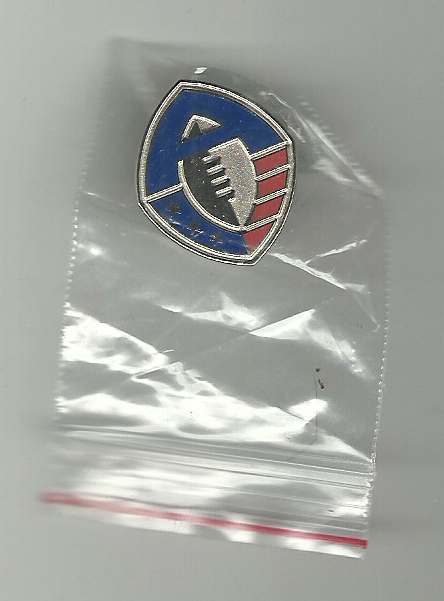 When asked about the league, Charlie smiled, and said, “I don’t know what’s going to happen, but based on how great San Antonio has been, you guys should be able to keep the rights to it forever!” Ebersol then handed out every single one of those lapel pins to the fans sitting around me. It reminded me of when I was 25, and I worked for a brokerage company in 2002. There were rumors of downsizing, and the CEO came in and talked to us about what was going on. His response and body language was about the same as Charlie’s, and I picked up on it, but didn’t want to believe it. Two months later I was laid off as the company closed the location I worked at. The San Antonio Commanders versus the Arizona Hotshots was the last game played by the AAF. Two days after the game concluded, the league was shuttered. Fans, players, executives, coaches- it all ended. Tom Dundon, (the Chairman and the guy controlling the league’s purse strings), abruptly decided to stop funding the league. Charlie and the other founding members of the league were dumbfounded. They had a 3 year plan, but Dundon had plans- otherwise, and decided to cut loose after only a few weeks. Things have a way of coming full circle. My dad used to take me to WLAF games back in the early 90s. This was the first time I had a team since then that I could relate to in SA like that, and I wanted to share that with my father- but he passed away before the first game at the beginning of the year. I hoped that living vicariously through the guests that I had take his seat, that I could keep the memory and dream alive of spending time with my dad, and to not have to confront the fact that he died, but that too has come to pass. And just like the AAF, I just wished I had more time.